Hello my name is Jennifer and I am a Pinterest addict. Not a day goes by where I don't pin something, but for all the pinning I do very few of the projects ever get completed. 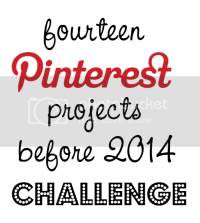 This year I plan to change that by joining the fourteen pins by 2014 challenge from Mama's got it together. I am sure that I will find plenty of time to do all this between sewing my children's entire wardrobe from scratch, helping my sister with her new triplets, and possibly moving (the property I rent may be rezoned). But, just in case, I think I'll try to choose a few pins that go well with everything else that has to get done. I haven't chosen all of my projects yet. I want to save a few for things I find later but here is what I have chosen so far. Good luck! Everything on my Pinterest boards are my to do list- I'll never get it all done before I die!! !